Is Hiring a Mover Worth the Money? Whether you’re just going across town or gearing up to relocate across the country, preparing for a move is stressful. Planning, packing, loading up a truck, sorting through items to toss or give to charity, unpacking – it all seems like so much to handle. If you’re like most people, adding a move to your normally hectic schedule can end in pure exhaustion, or even disaster. This is why, for many people, a moving service can be the best money they’ll ever spend. Should you Do a DIY Move or Hire a Mover? A DIY move can work out well if your move is small and you have the time to plan and carry it out. Especially if you can fit everything you own into your car and your trip is short with few or no stops, moving yourself could be a breeze. Just don’t forget to turn off the lights! But, if you’ve accumulated a fair amount of stuff, whether you’re moving locally or long distance, hiring movers is often worth the money. Especially for people with busy lives who don’t move often, the amount of work and the possible problems and costly mistakes of moving yourself are just not worth the risk. 1. You’ll avoid risking serious injury moving bulky items. Beds, couches, bookcases, and other large pieces of furniture can be a real challenge to move. Even if you have a friend or family member to help you haul a bed down the stairs, all it takes is missing one step and someone winds up with a sprain or even a costly trip to the hospital. When you hire movers, you’ll have people who move heavy objects for a living. Professional movers are trained for lifting and moving heavy objects, usually wear protective gear and they are fully insured by their employer in case they do hurt themselves so you don’t have to worry. 2. With the movers doing the heavy lifting, you can focus on other important aspects of the move. Planning and logistics are a big part of your move. Besides the clearing out, packing and unpacking, you also have to coordinate things like services, utilities and internet, forwarding your mail, DMV changes and so on. Then don’t forget the numerous things that you’ll need to update with your new address, such as tax forms, insurance, bank cards, and other important aspects of your day-to-day life. Taking the biggest and most difficult part of moving off your plate can free you up to plan and execute all the other important details of the move so nothing gets left undone. This way, you won’t sitting in your new home after the move, eating cold pizza in a dark room with no electricity, and having no internet connection to update your friends on Facebook about your situation. 3. You don’t have to worry about your friends and family no-showing. It happens more often than you think with friends and family moves. Even with the best intentions, things come up and suddenly you are left holding the bag, er, box, on your own on moving day. When you hire a professional moving company, they will be there in the time window specified and will get the job done, rain or shine. 4. Movers have all the right equipment and supplies with them. With professional movers, you won’t have to figure out how to protect that big new TV screen, or dismantle your four-poster bed without tools. Movers come with plenty of supplies like oversize dollies for your appliances and blankets to protect the corners of your nice furniture. They can help pack your artwork or fragile items, and can handle the heaviest things you own with ease. They’ll have the right size truck for the job, saving lots of time and hassle if you have to make multiple trips on your own. They’ll have all the right stuff, and you will have saved time not planning, researching and shopping for supplies you think you need that you’ll likely never use again. 5. Movers have insurance for your valuables. If you or a friend drops your new TV while awkwardly getting it out the door, it’s done for. If you hire a mover, there is usually some free basic coverage as well as different levels of affordable insurance options based on your situation that will give you peace of mind in case something does happen during the move. A DIY move can still be doable depending on how far you’re going and what you’re taking with you. In general, the more stuff you’re taking with you, namely the more valuables and more bulky items like furniture, the better off you’ll be with a mover. Make sure they have an office and it’s not just a guy and a truck – avoid unlicensed, fly by night movers. Do not go with anyone asking for cash up front. This is likely a scam. Make sure your movers are fully licensed and insured. This information should be on their website. Get a written quote for your move. Professional movers will visit your home or ask detailed questions about how much you are moving to make sure the quote is accurate. Make sure all charges are fully explained and disclosed. Check out their reviews online to see what other customers have experienced. Ask as many questions as you want so you feel comfortable with your movers before you sign. Click here for more information on what to look for in a good mover. 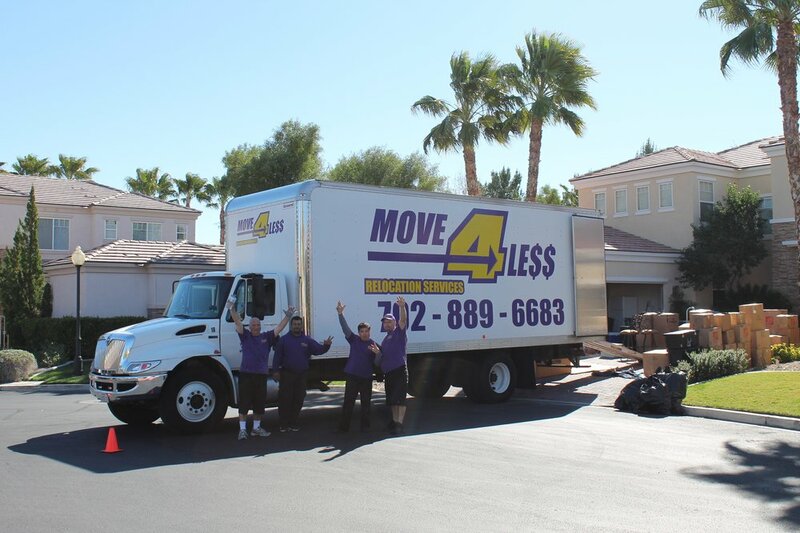 Move 4 Less has provided over 60,000 moves to Las Vegas customers over the years, so we know what we’re talking about. We handle any size move, local or long distance at very affordable prices. 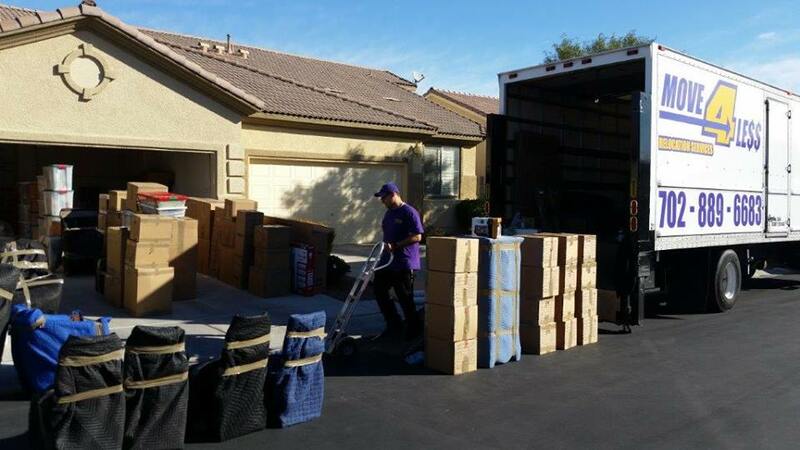 When you’re ready to make your Southern Nevada move, give us a call at 702-889-6683.